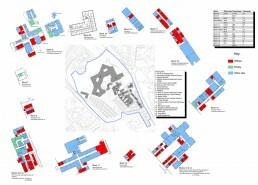 The existing hospital site has been substantially redeveloped since 1998. 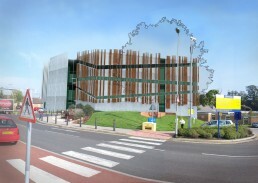 Most of the existing hospital (dating back in excess of 60 years) had been demolished with services relocated into a new state-of-the-art facility known as the UHND Building. 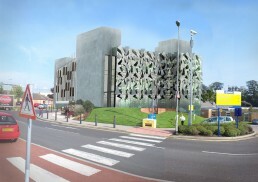 Existing accomodation off the existing East Wing Corridor was originally planned to be incorporated into the new UHND Building, but cost restraints meant that the area was retained. The contractor who are responsible for maintaining the UHND Building would not provide full repair services unless the buildings are brought up to Category B Condition – which was not economically feasible. The existing buildings were refurbished and extended over the decades which have resulted in several forms of building construction. 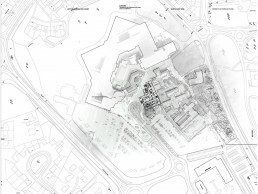 As it was not economical to upgrade the existing East Wing Corridor Buildings it was proposed to relocate the various departments and demolish the existing buildings, with the exception of Dryburn Hall and the Staff Residences. This was achieved by utilising available space within the UHND Building, moving some departments off-site and by moving some departments into a new support services building.